The Sankara Nethralaya Academy, a unit of Medical Research Foundation, was established on January 25, 2010 with the blessings of His Holiness Jagadguru Sri Jayendra Saraswathi Swamigal of Kanchi Kamakoti Peetam. This exemplary institute is headed by the dynamic leadership of Dr.S.S.Badrinath, Chairman-Emeritus & President, Medical Research Foundation, with enduring dedication to offer a pursuit of excellence in education and research. The members of the governing board provide constant support to implement “Excellence through Knowledge”. We draw inspiration from the words of one of Tamil Nadu’s famous poetess Avvaiyar, who once said, “Numbers and letters are as important as the eye (is to the human being).” The Academy, thus, attaches prime importance in imparting comprehensive education and extensive high quality training to the students by fostering the cooperation between the academic and hospital eye care community. Located in the heart of the city, with exquisite buildings, ample infrastructure such as air-conditioned and multimedia facilitated class rooms, modern laboratories, well–stocked library, state-of-the-art computer and internet facilities, dedicated and eminent faculty, the institution holds a great promise to make a difference in enriching the academic quality to produce talented health care professionals and administrators. The Sankara Nethralaya Academy offers programs, designed exclusively by the experts from top notch institutions. 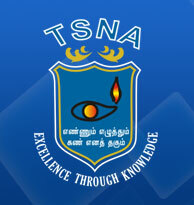 To achieve academic excellence, TSNA has affiliated with The Tamilnadu Dr. M.G.R. Medical University and has collaboration with leading institutions such as the Association of British Dispensing Opticians (ABDO), UK, Twintech International University College of Technology, Malaysia, and Madras Management Association. With so much awaiting for the students at TSNA, it is their unique opportunity to carve a niche for themselves, that enables them to become a responsible, well-qualified and discerning citizens to benefit the public.